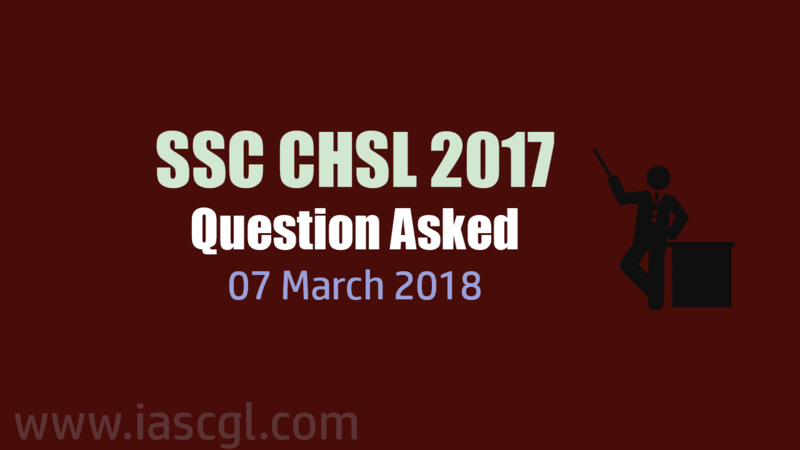 Question asked in SSC CHSL 2017 Tier I exam on 07 march 2018. In UDAN, what does "D" mean? One question related to cool & hot air. In FRDI, what does "D" mean? One question from Dalton Theory? ⇒A period of six years (A)/ have elapsed (B)/ since I last saw her. (C)/ No error (D). A person bought articles at 30 Rupees. For how many rupees he must sell to gain the profit of 30%? What will be the compound interest on ₹25,000 after 3 years at 12% per annum? The bank decided to ______ them the monkey as they were reliable clients. One word substitution ‘Smooth ruffled feathers’. ⇒ I must say to a feeling of uneasiness. The idiom ‘Burn your boats’.